Experimental results from my publication “Pink Moon: The Petrogenesis of Pink Spinel Anorthosites and Implications Concerning Mg-suite Magmatism” indicate that orbital remote detections of pink spinel (MgAl2O4) anorthosite lithologies (PSA) are chemically linked to the ancient and plutonic Apollo magnesian-suite samples. Thus, spinel-bearing lithologies detected remotely can be used as a proxy for Mg-suite volcanic and magmatic activity on a global scale. Fig. 1. From Prissel et al., (2014). Experimental spinel compositions relative to lunar spinels from mare samples (dark gray field), Pink Spinel Troctolite samples (pink field), and spinel compositions of PSA from M3 (dashed light blue box). Light gray-filled circles are experimental spinels produced during Mg-suite parental magmas and anorthite - consistent with M3 PSA spinel. Plus signs are experimental chromites produced during crystallization of synthesized mare-like lunar basaltic compositions - inconsistent with M3 PSA spinel (Green et al., 1971; Donaldson et al., 1975; Elkins-Tanton et al., 2003). Green-filled circles are experimental spinels produced during interaction of Apollo 15C green glass and anorthite - also inconsistent with M3 PSA spinel. Light gray, apex-down triangles are chromites that co-precipitated with olivine in less-contaminated regions of the melt during Mg-suite + anorthite interactions. Only spinels produced during Mg-suite + anorthite experiments are compositionally consistent with M3 PSA observations. Fig. 2. From Prissel et al., (2014). 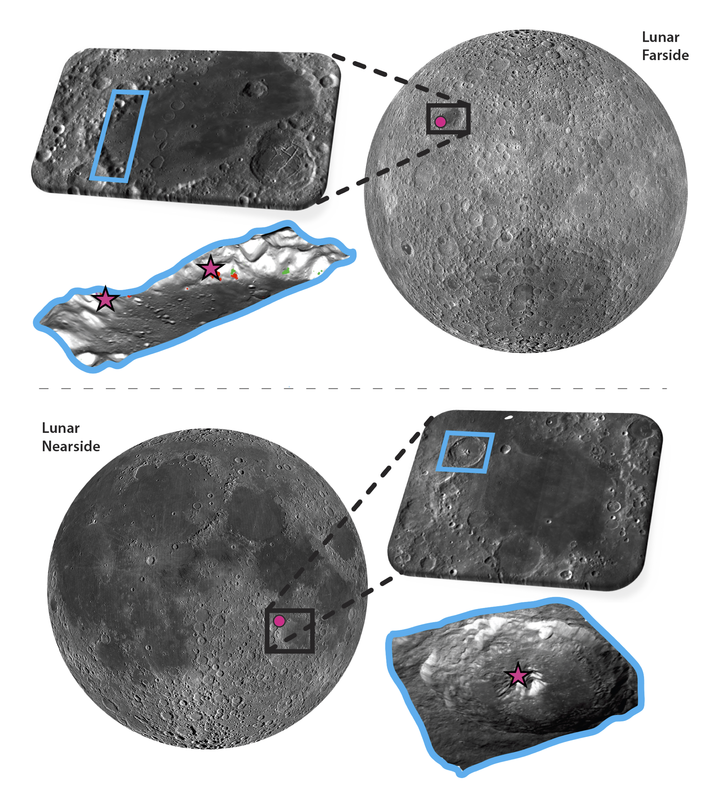 Initial spinel detections from NASA's Moon Mineralogy Mapper on the lunar farside and nearside (pink filled circles). Spinel-rich detections are found on both the nearside and farside of the Moon (Pieters et al., 2014). PSA occurs in central peaks, crater rims, and basin rings indicating a deep crustal origin and transported to the surface during impact excavation. Top (Lunar Farside): Spinel-rich lithology detected on the inner-ring of Moscoviense basin (Pieters et al., 2011). Perspective view outlined in blue modified from Pieters et al. (2011) where green and red patches represent olivine and orthopyroxene. Spinel-rich lithologies are indicated by pink stars. Bottom (Lunar Nearside): Central peak of Theophilus crater within the Nectaris Basin (Dhingra et al., 2011). Perspective view outlined in blue modified from Dhingra et al., (2011), where the pink star represents the approximate location of spinel-rich lithologies.